Diving from a liveaboard near a remote island in South America, I was hanging out on a coral ledge at 93 fsw (28 msw) watching Hammerhead and Galapagos sharks at a cleaning station. As I started to swim to a different position, I hit the inflator button on my new BCD. The button jammed and shot me straight up to the surface in an estimated 15 seconds, despite me frantically pulling on the shoulder mounted dump valve. There was so much noise and so many bubbles surrounding me and obscuring my vision that I probably could not have disconnected the inflator hose even if I had thought to do so. I broke the surface not far from the dive skiff and was picked-up where upon the skiff driver immediately started me on a DAN bottle of oxygen which I continued to breathe from after returning to the boat. Also at the divemaster's direction, I took a cool shower, drank lots of water, stayed quiet and mostly out of the sun for remainder of the day. This was the 18th dive on the last diving day of a seven day diving trip. We had been diving nitrox at approximately a 32% mix all week. 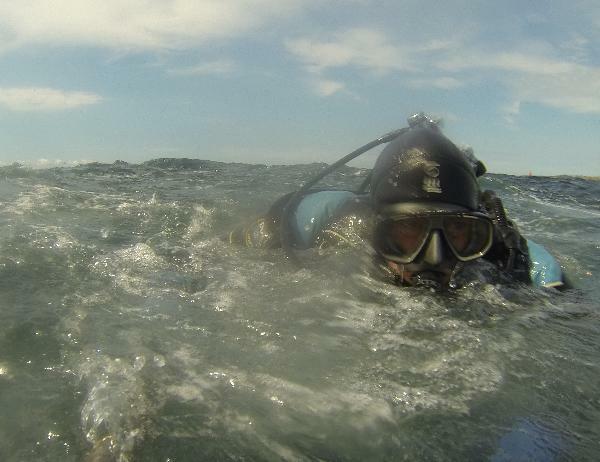 Dives were generally in the 100 fsw (30 msw) range for 50-60 minutes. This particular dive was the first dive of the last day and only lasted 20 minutes which may explain why I have had virtually no after effects from this incident. This diver was very fortunate that this unforeseeable event happened during the first dive of the day, after only 20 minutes, and while breathing nitrox. However, given that it was the diver's 18th dive in a week and this took place in a remote locale, it was prudent to breathe oxygen, maintain adequate hydration and forego the rest of the day's diving. During diver training it is common to practice quickly disconnecting an inflator hose in case just such a runaway inflation were to occur. There is something to be said in favor of all divers regularly practicing this skill at the end of a dive, while at the surface. The more often a diver tries to quickly disconnect the inflator hose then the faster the diver will become at achieving it. Remember, once the inflator hose is disconnected then a diver must orally inflate the BCD to control buoyancy and this is another skill worth maintaining proficiency in, at the surface, after diving. © DAN, Inc. All rights reserved.